"Cinnamon" . Encyclopædia Britannica (in English). 6 (11th ed.). 1911. p. 376. ^ a b Bell, Maguelonne Toussaint-Samat ; translated by Anthea (2009). A history of food (New expanded ed.). Chichester, West Sussex: Wiley-Blackwell. ISBN 978-1405181198. https://books.google.com/books?id=QmevzbQ0AsIC. "Cassia, also known as cinnamon or Chinese cinnamon is a tree that has bark similar to that of cinnamon but with a rather pungent odour"
^ “Cinnamon”. Encyclopaedia Britannica. (2008). ISBN 1-59339-292-3. https://global.britannica.com/plant/cinnamon. 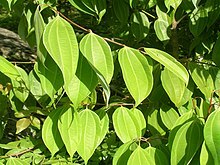 "(species Cinnamomum zeylanicum), bushy evergreen tree of the laurel family (Lauraceae) native to Malabar Coast of India, Sri Lanka (Ceylon) Bangladesh and Myanmar (Burma)." ^ a b Burlando, B.; Verotta, L.; Cornara, L.; Bottini-Massa, E. (2010). Herbal principles in cosmetics: properties and mechanisms of action. Boca Raton: CRC Press. p. 121. ISBN 978-1-4398-1214-3. https://books.google.com/books?id=MaAZMbSxNt4C. ^ Pliny the Elder; Bostock, J.; Riley, H.T. (1855). “42, Cinnamomum. Xylocinnamum”. Natural History of Pliny, book XII, The Natural History of Trees. 3. London: Henry G. Bohn. pp. 137–140. https://archive.org/details/naturalhistoryof03plin. ^ a b c Pliny the Elder（大プリニウス） (1938). Natural History（博物誌）. Harvard University Press. p. 14. ISBN 978-0-674-99433-1. https://books.google.com/books?id=L35fAAAAMAAJ. ^ Gray, E. W.; Miller, J. I. (1970). “The Spice Trade of the Roman Empire 29 B.C. – A.D. 641”. The Journal of Roman Studies 60: 222–224. doi:10.2307/299440. JSTOR 299440. ^ Mallari, Francisco (December 1974). “The Mindinao Cinnamon”. Philippine Quarterly of Culture and Society (University of San Carlos Publications) 2 (4): 190–194. JSTOR 29791158. ^ Braudel, Fernand (1984). The Perspective of the World. 3. University of California Press. p. 699. ISBN 0-520-08116-1. ^ Culinary Herbs and Spices, The Seasoning and Spice Association. Retrieved 3 August 2010. ^ Pereira, Jonathan (1854). The Elements of materia medica and therapeutics. 2. p. 390. https://books.google.com/?id=IrXszQ77xhYC&pg=PA390&lpg=PA390&dq=iodine+in+cassia#v=onepage&q=iodine%20in%20cassia&f=false. ^ Czarra, Fred (1 May 2009) (英語). Spices: A Global History. Reaktion Books. ISBN 9781861896827. https://books.google.com/books?id=6ZLxAQAAQBAJ. ^ Yokomi, Naoka; Ito, Michiho (1 July 2009). “Influence of composition upon the variety of tastes in Cinnamomi cortex”. Journal of Natural Medicines 63 (3): 261–266. doi:10.1007/s11418-009-0326-8. ISSN 1861-0293. PMID 19291358. ^ Jayaprakasha, G. K.; Rao, L. J. (2011). “Chemistry, biogenesis, and biological activities of Cinnamomum zeylanicum”. Critical Reviews in Food Science and Nutrition 51 (6): 547–62. doi:10.1080/10408391003699550. PMID 21929331. ^ Harris, Emily. German Christmas Cookies Pose Health Danger. National Public Radio. http://www.npr.org/templates/story/story.php?storyId=6672644 2007年5月1日閲覧。. ^ “Coumarin in flavourings and other food ingredients with flavouring properties - Scientific Opinion of the Panel on Food Additives, Flavourings, Processing Aids and Materials in Contact with Food (AFC)”. EFSA Journal 6 (10): 793. (2008). doi:10.2903/j.efsa.2008.793. http://www.efsa.europa.eu/en/efsajournal/pub/793.htm.